This spring I will celebrate 5 years of blogging. That’s five years of writing, photography, decorating, sewing and painting. I’ve painted a ton of things I have shown on my blog, and used quite a few different paints, (click HERE) but this is the paint that honestly is the easiest to use if you want a subtle antiqued look with paint. The paint and products I used were graciously provided by Amy Howard At Home. Here is my raw piece. It’s a vintage European piece. It’s hand-carved wood. So the first thing I did was to dust it off. It was very dusty. Then I mixed up my paints. I used Amy Howard Toscana Paints. I mix 1 part Toscana Noir paint and 2 parts Toscana Cote d’Azur. I stir the powders until they are completely incorporated. Then I added water until it had the consistency of pancake batter. Next I painted the piece. You can see how dark it is. The paint dries quickly, even faster if you use a hair dryer. See how much lighter it gets as it dries? And here is it all the way dry. Notice the spots. That’s the specs from the powder that did not fully dissolve in the water. It happens sometimes and I am guessing that if I used warm water that would help keep this from happening. But still we’re fine. Let’s keep going. Now I flecked on some of the antiquing glaze using a flicking motion. Then I applied more with a sponge. It usually looks like a wreck at this point, but I’m still not worried. Now I let the piece dry again. Then I applied the light antiquing wax. And there you have it. I’m done. This process removed a lot of the paint. 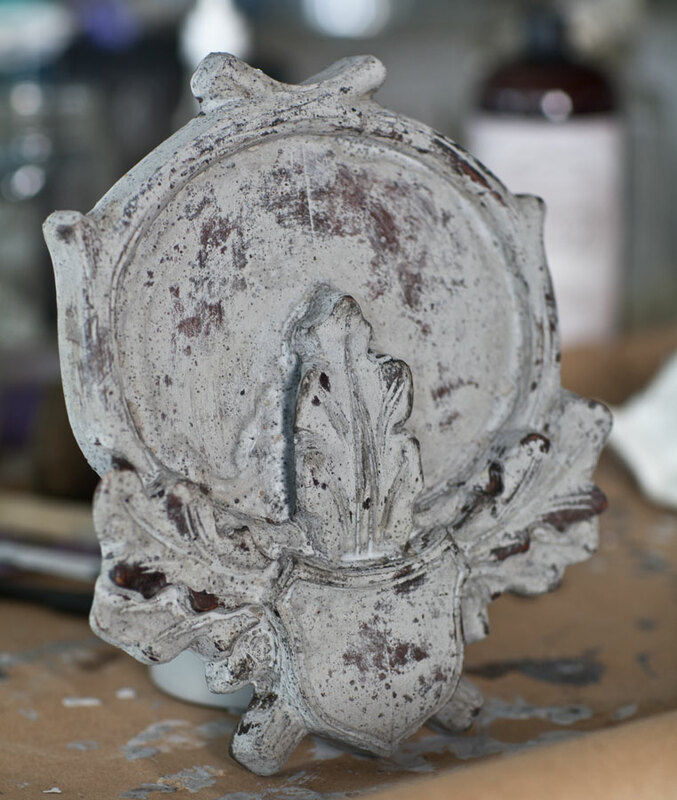 If you want a look with more paint, then use less antiquing glaze. Use more if you want less paint left. I think it looks as if the paint has worn off over time. And here we have it on the wall in the bathroom. That’s it. It took me less than an hour of active time. I’m not counting the drying time. That’s not much of an effort really. Here are a few tips I have for you. Find pieces to paint at a junk shop/antique store/thrift store/flea market. It is difficult to find hand-carved wood like that in a new piece, so typically you’ll need to find a place that sells vintage or antique things. 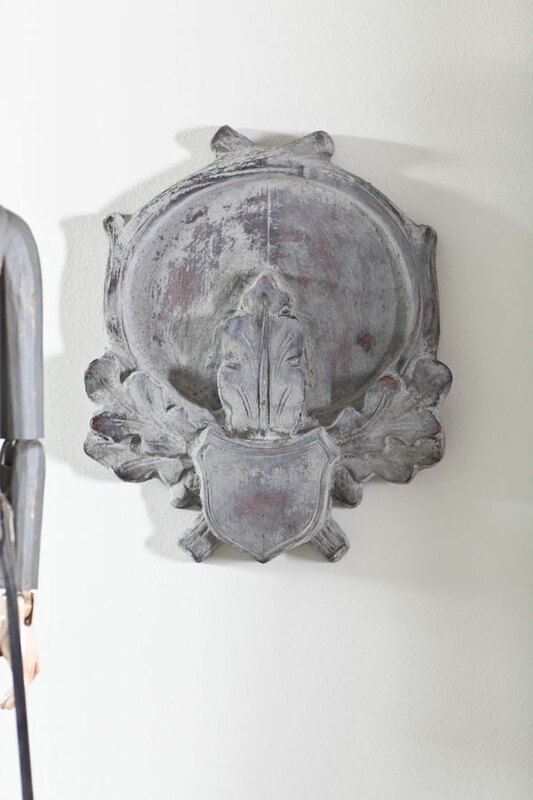 Look for a piece with carving for an awesome look. 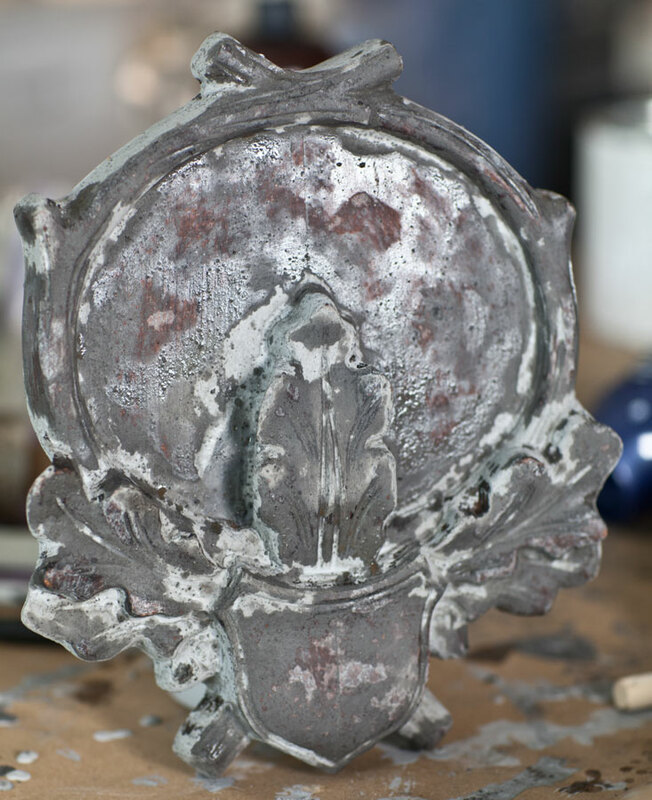 You don’t have to (CLICK HERE for a non-carved example) but the carved pieces can look amazing when antiqued. 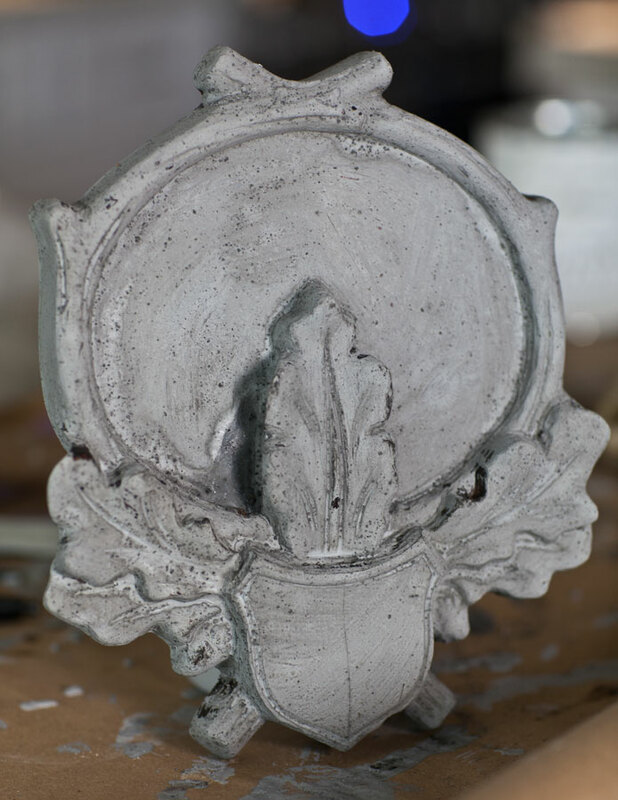 Practice your technique on the back of a piece or on a test piece first. That way you won’t have any surprises. 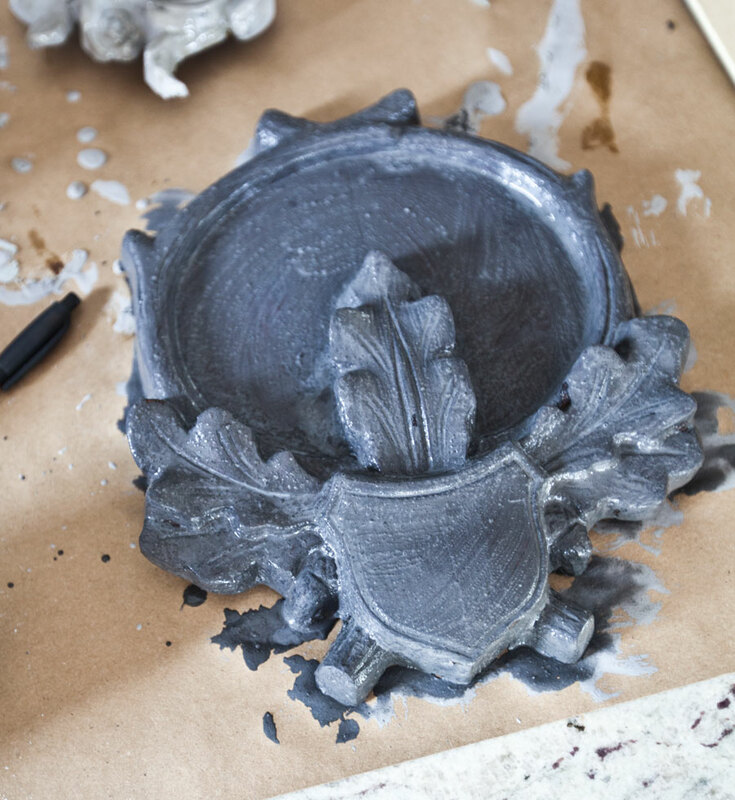 Always finish with a wax coat on your piece to protect the Toscana paint since it is activated by water. I love the result Anita…..I cannot wait to start using Amy Howard products this year. 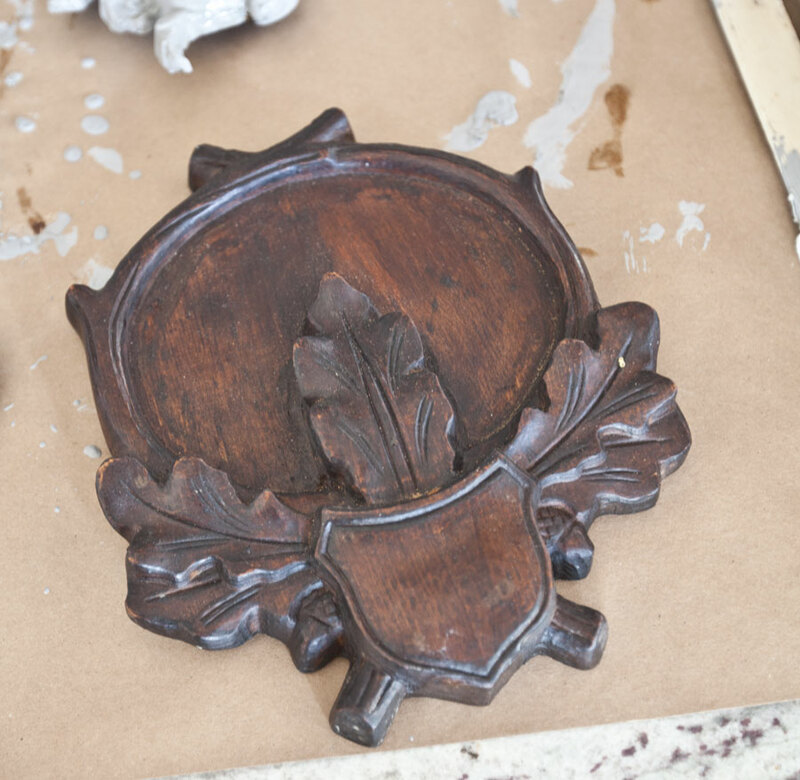 I love the no sanding idea….this piece that you transformed truly looks magnificently aged over the years! Beautiful job! I love the Amy Howard paints. They carry them at my local ACE hardware…her full line. I just painted my bar stools yesterday with the spray lacquer in La Grange. I’m trying to decide if I want to go over them with a liming wax to give them the beachy worn look I love. 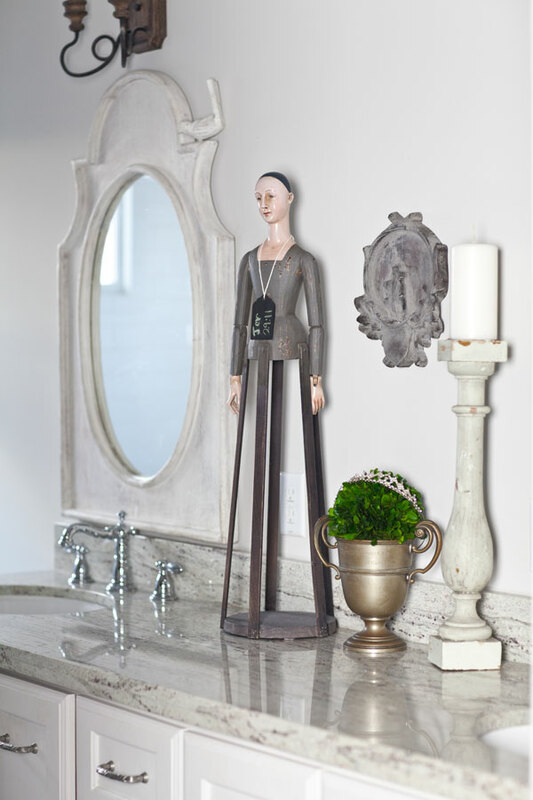 I will have to try her Toscana paints…and I have the perfect piece sitting in the garage right now. I love the outcome. I recently bought a child’s wooden highchair at a yard sale. I immediately went to my ACE who just started caring Amy Howard. I bought the At Home One Step Paint in Natural. I am excited to try it. Now I need to go back and get the wax?? To seal it?? Love the finished piece. It looks great. The process seemed very simple too. I love the finish Anita! Wow, 5 years has gone by fast! It’s great that you stuck with it. Lot’s of dedication and had work. Haven’t tried the Amy Howard Paint yet. I just checked the prices at Ace and it’s comparable to Anne Sloan Chalk paint (which is my favorite). 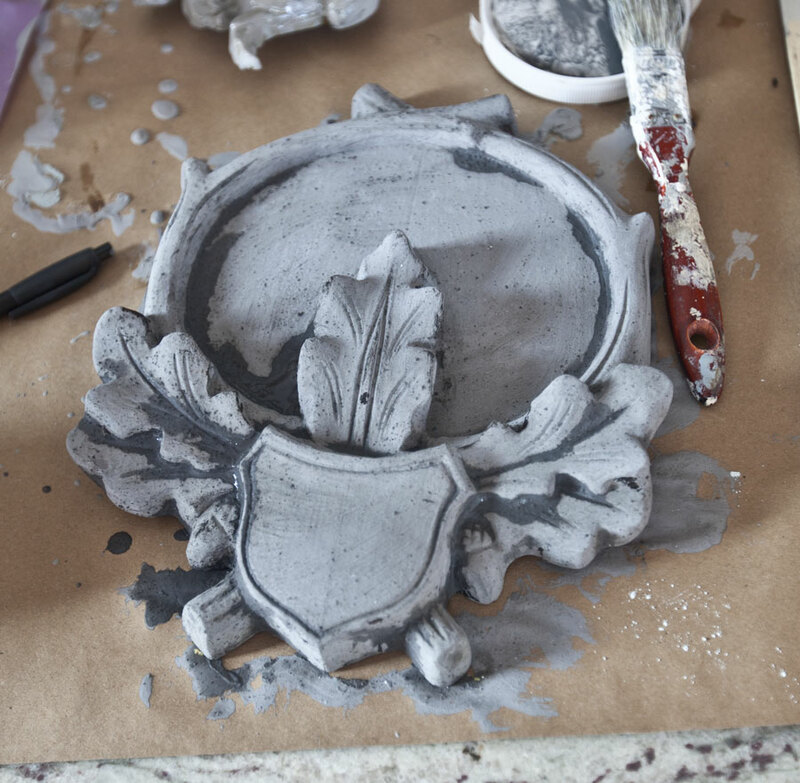 I’ve tried quite a few brands of chalk paint and furniture paint and I’m the most comfortable with Annie Sloan. People either love it or hate it. I’ve become so used to it and have developed so many techniques with it that I love it. I’m not opposed to trying different brands. I tried the CeCe Caldwell paint and it’s ok but not my fav. I love the European carved piece you painted, it’s beautiful. It does look naturally aged. I’d like to recommend a movie set in Marsaille, France. It’s, “The Count of Monte Cristo,” starring Jim Caveisel. I think it’s pg13. It has a good moral to the story and it’s very entertaining. It’s one of my favorites! Lovely. This is the first I have heard of these products, I am off to check them out. Thanks for sharing! Looks great did you use chalk paint ? No that is milk paint Susie. I love all your inspirations! Found you in Country French magazine and had to sign up for your newsletter/blog. Thanks so much. Welcome Ceal!!! I’m so glad you found me. Love the look. Now must visit local ACE to see if they carry the paint. Lovely! In the last photo Could you please tell me the style name of the girl statue? I see them a lot but don’t know what to do a search for. And where is the best place to find them? thank you! Thanks for the introduction to Amy Howard paints. I like the end result of your project and want to try this myself!